The Oregon Ducks debuted their home Pac-10 schedule against The USC Trojans at the $227 million replacement for the aged but beloved McArthur Court last Thursday. An opening ceremony combined with a speech from Nike CEO Phil Knight warmed the hearts of the sold out crowd before the Ducks first Pac-10 win this year. Many doubters claimed that “it’s the same old team in a brand new venue.” However, the Ducks shocked viewers on regional TV with a 68-62 win over the Trojans that night, playing their best game thus far under Coach Dana Altman. Matthew Knight Arena houses 12,400 seats, an increase of more than 3,000 in capacity than old venue, McArthur Court and is now one of the largest college arenas on the west coast. While it may not match the 33,000 seats of the Carrier Dome, the stylish court and Nike sponsorship throws in a sense of pizzazz that even Syracuse can't match. 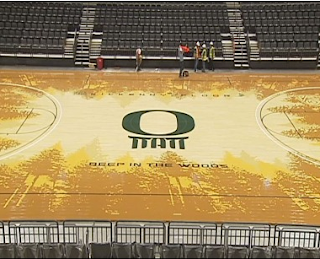 But there's more to Matthew Knight arena than the revamped floor and attempts of sparking hope back into the men's basketball program. Knight may have paid $100 million for the arena but he isn't receiving much praise outside of Eugene. He'll make the money back quickly with all the free advertising Nike gets out the new arena that much isn't hard to understand. But the rest of the funds had to come from somewhere. Apparently the State of Oregon took out a $200 million debt issue in the name of the tax payers to cover additional costs. However, due to interest charges some expect this bill to reach close to $400 million before it’s entirely paid off. Many critics have a problem with this debt, as well as the name of the arena. 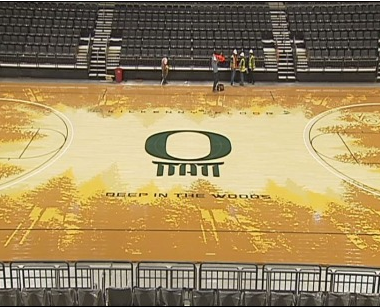 Some claim that if Oregon tax payers are paying $400 million for this arena, then it should be named “The Oregon Taxpayers Arena,” but that's ludicrous. People have paid for sports for over a century. Sometimes I stop and wonder why I'm paying to watch college or professional sports, when I can just as easily run to the gym and play basketball on my own. And if I can do it, then so can the rest of the Oregon tax payers. But guess what? We don't. Or if we do, we still pay to watch sports anyway, especially in this state, because the Blazers have sold out 130 straight games. Ducks football has sold out 73 straight games and Matthew Knight Arena may be starting a similar streak as soon as the team puts together a few victories and returns to the NCAA Tournament. It's only been four years since the Ducks reached the Elite Eight, where they lost 85-77 to the Florida Gators, who won the national championship that year. Coach Altman is no stranger to that tournament, entering March Madness eight times since 1991. So, for all of the doubters, sit back and relax. The majority of complainers come from sports journalists anyway. The same people who haven’t missed a Ducks football or basketball game in years. It isn’t like Phil Knight named the arena after himself. Until I see a lights shining around “Uncle Phil’s Stadium,” I will have all the respect in the world for the man. Plus, he pushed $100 million into the pot, which is the only reason this project was a possibility. And then he names it after his son who tragically passed in a scuba diving accident in his mid thirties? Amen to Uncle Phil.